Roast two sweet potatoes in the oven for 45 minutes at 400 or until very tender. When it is done, turn off the oven but leave the sweet potatoes inside to keep hot while you cook the kale. (Make sure to pierce the sweet potatoes with a knife or fork in several places before roasting). while the sweet potato is still in the oven, heat the olive oil over medium heat in your skillet. When hot, add the garlic, chilies, rosemary and fennel seeds. After about 30 seconds or so, add the chopped kale and saute for several minutes or until tender. Take the Sweet potato out of the oven and remove the skin. The sweet potato should be nicely caramelized. 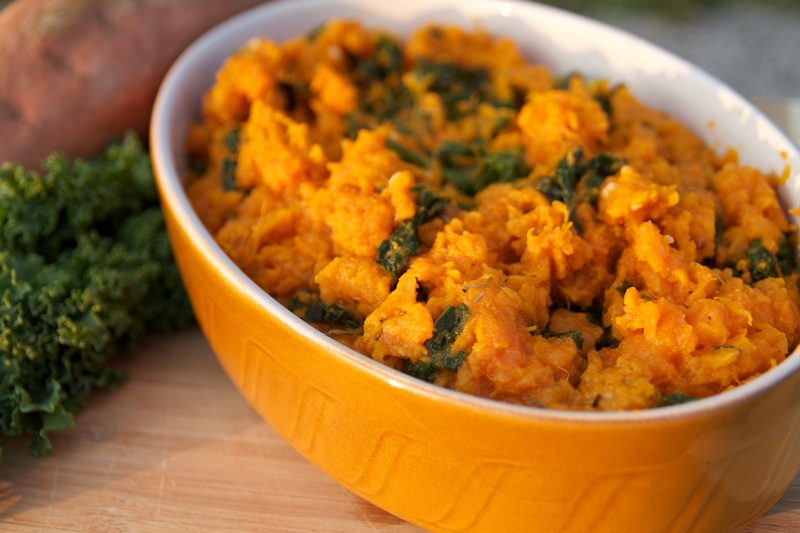 Put the kale and the sweet potato into a serving dish and mix everything together. The sweet potato should be soft enough to mash up easily. Add salt and pepper to taste. Try this recipe out. Let me know what you think.